The Staffordshire Hoard is the largest collection of Anglo-Saxon gold and silver metalwork ever found anywhere in the world. The Hoard, discovered on 5th July 2009 in a field near Hammerwich in Staffordshire, totals 5.094 kilos of gold, 1.442 kilos of silver and 3,500 cloisonné garnets, nearly all martial or warlike in character. The Hoard was taken under the care of the Birmingham Museum & Art Gallery and the Potteries Museum & Art Gallery, where teams of experts worked to conserve the extraordinary collection. The project, led by Pieta Greaves ACR and Deborah Cane ACR at Birmingham Museums Trust, was honoured at the 2015 Icon Conservation Awards where it picked up the Pilgrim Trust Award for Conservation. Judges described it as "the poster project of the sector". A year on from the awards, Pieta and Deborah along with conservators Kayleigh Fuller and Lizzie Miller talked to Icon about what the project means to them, their community and the wider profession of conservation. The Staffordshire Hoard was saved for the West Midlands. How important is it to keep cultural artifacts local to their place of origin? Pieta: The Staffordshire Hoard programme provides a successful example of conservation driving wider aspects of a project, beyond the conservation of the objects themselves. In this case, conservation has acted as a catalyst to encourage public access and participation in the wider project. Through the Staffordshire Hoard Trail Partnership, the Hoard has generated interest beyond its immediate historical context and people in the region have developed a strong sense of local identity and pride, whilst the high level of interest in the Hoard has delivered increased support for museums and socio-economic benefits for the region. It is hoped that future initiatives will build on successes so far, to extend the impact and benefits of this extraordinary find. You did a lot of work to engage the public and to thank them for their support. Can you tell us a bit about the reaction you had to these efforts? Deborah: The public have always been very generous in their support of the project and the access given to them. This has come in many forms, from a personal thank you at the end of a tour, letters or emails of thanks and of course ongoing cash donations to the conservation programme. Being part of the National Geographic documentaries and Time team shows has meant that on occasion I would be asked on the train ‘are you the lady from the gold hoard show?’ whereupon I would proudly say yes and enter into a conversation about museums and heritage. There is such a passion for history out there. Was there a particularly low point in the project you can share with us? Pieta: The programme has not been without some challenges. Simply ensuring that the correct selections of objects are available to the research and conservation team is a significant challenge when four display venues are involved. It has required, and continues to require, extremely high levels of dedication by research and museum staff in order to facilitate the programme. The museums have developed a flexible and pragmatic approach to exhibition content to address the fact that object rotations for research purposes can be frequent. The engagement programme assists in keeping the public informed about the reasons for changes to the collection displays. What highlights or milestones made you particularly proud? Deborah: For me it was the creation of the collaborative opportunities for students and professionals to come and share their skills and knowledge with each other and the public, and the support of the specialist within the conservation, archaeological and historical specialisms. Also, the extensive use of video blogs to allow access to those who could not reach the museums in Birmingham and Stoke, allowing them to not only follow the conservation of the objects but to get an insight into what it is like to be a conservator. It also allowed those booked on tours to be very well informed prior to their visits and ask what is the next phase of work. Working with National Geographic to create two documentaries was very interesting and gave me glimpse into the not-so-glamorous work of TV, with multiple takes and a camera following your every move. Meeting the Pope was interesting. He was much smaller than he looks on TV but had a lovely pair of red silk shoes. Pieta: For me the highlight is working with so many specialists to study the Hoard and the discovery of completely new objects, such as the silver gilt pommels. These new pommels represent the snapshot of the hoard project, from first documenting and conserving the small fragments with thorns, through to reassembling them for display, these objects have been on a fascinating conservation journey. The pommels are the result of close working between conservators and the finds specialist, Chris Fern, discovering and reassembling small fragments over many months. And of course winning the Icon award! Why was the Icon Conservation Award important? Deborah: The award was amazing as it was an acknowledgement from our own professional body and the profession as a whole, who have been extremely supportive throughout the project. It also acknowledged all the hard work of the teams involved, from those who instigated the project to those who have taken it into phase two and carried on the amazing work in joining fragments. It is also a big thank you to the Trust, the senior managers and the partners in Stoke who have been so supportive of the open access and could see the added value it can add to the museums and heritage sector. Pieta: Along with all the great things Deborah has highlighted, the prize money was a timely help to the project. It was used as part of the fundraising for the stage two research priorities. You mentioned that the project tried to promote conservation as a meaningful profession. Does the field lack public understanding? Deborah: I believe that the public are aware of restoration and therefore conservation; it's simply that the word 'conservation' is used for numerous professions, so the public can sometimes be confused. The access around this project did highlight that the general public and therefore future conservators did not know you could do this as a profession so there may be some advocacy work required at the career advice stages within schools. 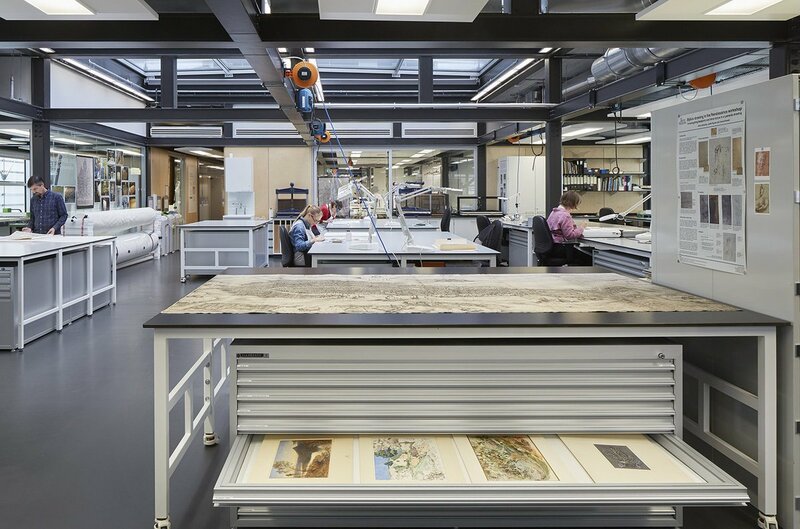 However, once the public are in the studios they are always wowed by the level of access to objects and information that the conservators provide and are very supportive and knowledgeable of the need for the work that we provide to preserve the heritage for future generations. Pieta: I think perhaps we spend too much time discussing how the public does or doesn’t know who we are. And we should just take the opportunity to promote what we do when we can, as honestly as we can. The hoard has shown that the public enjoy the complex chemistry of what we do as well as the practical skills; we have spent no time creating simplistic narrative of what we do, and they have loved it. I think the real challenge is within our own institutions and with policy makers who decided the ultimate fate of conservation funding. With so many public cuts we need to demonstrate how what we do is important to the future of the cultural landscape. Almost a year on from the Icon Conservation Awards, what has changed at the Hoard? Pieta: The project is now in the final roundup of phase two. Objects have now been re-joined as far as possible and finds specialist Chris Fern has almost completed the full catalogue of the objects, allowing a real overview of the objects within the hoard and how they relate to each other. Only recently, conservator Kayleigh Fuller and volunteer Sue Hull created a new object over a two-month period, tirelessly assessing, documenting and reassembling various elements of the object. The last great discovery of the Hoard will be the final form of the helmet, currently worked on by George Speake and Chris Fern. It will be an amazing object to see. Now the conservation is completed, we are writing up for publication and records. We hope that publication will be in 2018 in the form of a book and an extensive digital resource freely available via the internet. Lizzie: Since the award we have been getting ready for a new touring exhibition. Warrior Treasures is currently in Royal Armouries in Leeds and will travel to Bristol Museums and Art Gallery in October 2016. At the recent installation in Leeds, it was fantastic to see a new gallery which includes some of the most up-to-date research of the hoard. Kayleigh: One of my tasks in phase two has been working with the specialists to finalise the helmet material. This has been a rewarding collaborative process involving tiny fragments that have come together to form larger elements of panels. Just seeing the human forms come together has been a privilege. I have also devised a new mounting method to secure the tiny fragments in position, which has been an interesting conservation challenge. Finally, what's the most interesting fact we should know about the Hoard? There are so many interesting facts about the Hoard. Here are just a few. No two objects within the Hoard that have the same design! Learn more about the Staffordshire Hoard.